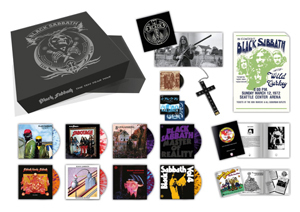 BLACK SABBATH are set to release a new, limited edition vinyl box set entitled The Ten Year War. This new set will bring together the band’s eight Ozzy Osbourne-fronted albums, plus a swathe of other rarities, all housed within exclusive artwork created by renowned street artist Shepard Fairey. 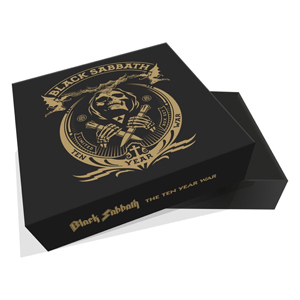 Unique to this release is the metal crucifix shaped BLACK SABBATH USB stick, which can be worn round the neck and contains MQA high definition audio of the eight albums. The extremely rare The Ten Year War brochure, reproduced from the original publication gives its name to this super deluxe box set. Pre-order now at tenyearwar.com, or pledgemusic.com/blacksabbath. The Limited Edition Box Set Includes: 8 x vinyl LPs meticulously reproduced in their original sleeves, re-mastered by renowned mastering engineer Andy Pearce from the original tapes and pressed on 180 gram splatter-coloured vinyl, each LP with unique and individual colouring. BLACK SABBATH are one of the world’s most popular and enduring heavy metal bands and are constantly credited with inventing and defining the genre. To this day, the world of metal - fans and artists alike - cites SABBATH as being both influential and inspirational. From the blues-laden metal which defined the band’s sound on their self-titled debut, to the multi-million selling follow-up, Paranoid, SABBATH captured the attention of a generation hungry for a new musical direction. However, the all-conquering enthusiasm shown by SABBATH’s rabid fan base wasn’t always mirrored by the gatekeepers within the music press, and it is this disparity which inspired the band to publish The Ten Year War brochure. This document was a playful dig at the journalists of the time with the witty tagline: “More good press than most – more bad press than any”. With a career spanning 50 years, BLACK SABBATH have proven time and time again that their musical heritage is unrivaled. Having sold tens of millions of records, sold out global arena tours and bewitched millions of dedicated fans, the band have built a catalogue envied by all.